JBL has become one of the best companies when it comes to Bluetooth speakers. Their products are quite affordable and offer pretty decent sound. Not to mention the feature to charge other devices such as phones or tablets. This time I decided to compare two speakers from JBL. 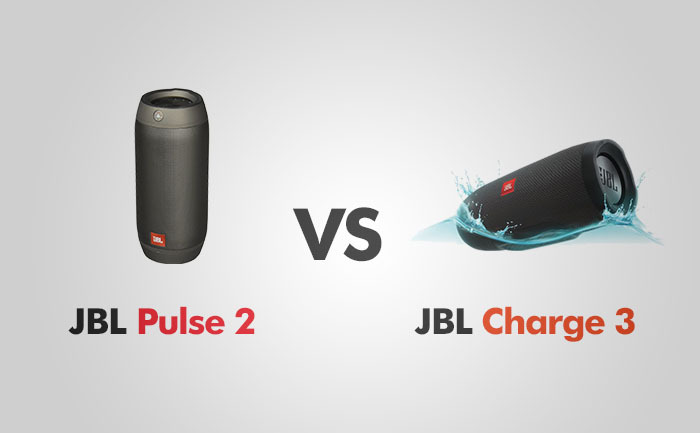 The first one is JBL Pulse 2 with dazzling LED lights and the second one is JBL Charge 3 with the charging feature. What distinguishes JBL Pulse 2 from Charge 3 and other Bluetooth speakers is that Pulse 2, similarly to its predecessor is wrapped with LED diodes that flash in accordance with the selected pattern. There are two main things that are different compared to the previous model. The first good thing is that the resolution of the LEDs is higher, making the light effects look better than before. What is a disadvantage is that there is no longer an equalizer mode for colors, meaning that LEDs are dancing to the selected pattern and not to the music? Which is a shame because this feature is available in the original Pulse. Pulse 2 comes with 12 different light show patterns, including fire, rain, fireworks, waves, stars, thunderstorm or fireflies. There is a significant change compared to the original: the device has a sensor to pick up colors from the environment. Just hold down the color prism button for the color to “match”. If you don’t want LEDs to be lit, just hold down the button to turn them off completely. The speaker has a dedicated app for iOS and Android to remotely control the lights. With new updates, the additional light show patterns will be added. You can disable LEDs only with the physical button on the device. It would be nice to have the same feature in the app. It’s similar in shape to UE Boom, but it’s slightly bigger and not as easy to hold in one hand. Contrary to Boom it has rubber feet that help the speaker stay in one place and not roll away. The device has a narrow control panel, where you can find all the controls. Behind the snap-shut, you will find a 3.5 mm aux input and the USB charging port. The Pulse 2 offers a splash-proof feature, which is very convenient. A slight amount of rain won’t do it any harm. But keep in mind it’s not waterproof, so don’t use it near a swimming pool. Charge 3 doesn’t offer cool lighting effects like Pulse 2 does. But it has a few features that can persuade you that this speaker is superior to its competitor. The shape of the speaker is similar to plenty of other speakers from JBL. It’s cylindrical with two passive bass radiators on both ends. The JBL speaker is wrapped in a protective material and available in a few different colors like, black, red, blue, gray and teal. The Fabric is combined with the rubber panel and the rest of the design makes the device IPX7-certified. This means it can survive in a water for 30 minutes at the depth of one meter. This is an improvement compared to its predecessor that was only splash-proof. It offers a rubberized stand where you can also find a row of small LED lights which show battery life. The more lights are lit, the more battery left. Under the rubber flap, there is a 3.5 mm socket for a wired connection to your phone, and a Type C USB port for charging smartphones. When it comes to sound, Pulse 2 is very loud – be prepared to lower the volume before using it in a small room. It sounds better than its predecessor. Music is not as distorted at higher volumes as it was in the original Pulse. In the world of speakers, bigger is usually better, so when comparing Pulse 2 to Charge 3 we shouldn’t be surprised that the bigger competitor wins in the sound department. Charge 3 offers 50 mm drivers (instead of 40 mm in Pulse 2) to give you a better experience, especially at the lower end of the frequency range. Thanks to the two passive radiators on each end, the bass is quite decent. It offers slightly better lows than its predecessor but lacks when comparing to the JBL Charge 3, which is punchier and better balanced. Charge 3 offers a powerful bass, more than some people would like, but if you like EDM and rap music it will be perfect for you. You can use both speakers in vertical and horizontal position. But when they are oriented vertically it affects bass radiators, negatively impacting sound. The highs in both speakers are not as detailed as I would like them to be. The guitars and vocals sound slightly weaker than their competitor – Bose Soundlink Mini 2. I think you have to make some sacrifices if you want to have a water-resistant speaker. The Bluetooth connection is good with these speakers. I could achieve about 70 feet outdoors and about 30 when using it indoors with a few walls between the speaker and a smartphone. The connection was strong and I didn’t notice any connection problems. The pairing is fast and if you use Android phones you can take advantage of the NFC feature – just touch the speaker and the mobile device together for fast pairing. To connect it manually, set the speaker to discovery mode, then press and hold the Bluetooth button. The speaker plays a small tone to let you know it is searching for a device. It plays the sound again to acknowledge you’ve been paired up. You can also use the JBL connect feature to link two JBL speakers and play music from the same source, offering better sound separation. Pulse 2 has a better battery life than the original Pulse. Now, it offers about 5 hours with the lights on. I recommend to turn them off, especially in the bright daylight, when you can’t see them anyway. This gives you additional 5 hours of playtime. Charge 2 offers 12 hours of battery life. With the newest speaker form the Charge family – Charge 3, you can have up to 20 hours – twice as much as Pulse 2. The next advantage over the Pulse 2 is that with the Charge 3, as the name suggests, you can connect the USB cable and charge your devices. This can be a really invaluable feature when you are on a trip and your phone is out of juice. Just plug your device and it will charge your phone while playing music at the same time. PROS: Volume level / Battery life / IPX7 certificate / JBL Connect / Power bank / Sturdy / 3.5 mm input jack / LED indicators. PROS: LEDs / Splash-proof / JBL Connect / 3.5 mm input jack. CONS: No SD card slot. CONS: Battery life / Not waterproof / Can’t be used as a power bank.